The Excursion has become our go-to home guitar. It holds its own with far more expensive guitars and has impressed everyone who's heard it. Put some power back into your acoustic playing and try one. Loads of character. Superb build quality and value for money. 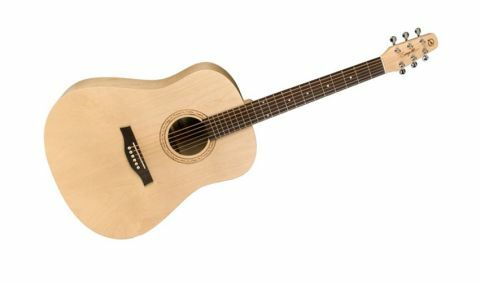 Part of Godin's Canadian empire, Seagull has an expansive range of attractive and pretty affordable acoustics and electros. The new three-guitar Excursion series, however, drops into the bottom of the price range and is the only series to feature a laminate top as opposed to solid spruce or cedar. A laminate top? Isn't that a real cheapo feature? Well, yes and no. While most lower-priced acoustics utilise laminate back and sides, a laminate top is unusual. But made correctly, there's no reason why it shouldn't sound perfectly good, and its three thin layers of hardwood could be much more stable than a low-grade solid- wood top. "You'll struggle to find a brand that's better made at this price"
In fact, it could work in your favour on stage, and although our sample is purely acoustic, adding a soundhole pickup creates a very tidy stage guitar with better feedback resistance than many solid-topped instruments. This guitar is certainly a bare-bones affair, with no edge binding - the only decoration being the burn stamp 'rosette' and headstock logo. But you'll struggle to find a brand that's better made at this price. The internal bracing and kerfed linings are impeccably crafted. The neck, too, with its solid rosewood fingerboard, tidy frets and slightly rounded edges, comes with quite an electric-like neck shape and width. Combine all of that with an impressive setup and quality enclosed tuners, not to mention a compensated saddle on the rosewood pin bridge, and you have a utilitarian guitar centred on affordability and quality over bling and on-paper specification. Of course, none of the above matters a jot if it doesn't play well and sound good. And that's where you're in for a treat. Aside from being a really easy, positive player, there's a real strength to the tonality and big, open rock voicings sound huge when you dig in with a pick. Upper-fret lead lines also have power and strength. "It has what so many low-end instruments lack: character"
If you lean on the bluesier side of the acoustic tracks, it's ideal; likewise, if you fancy a bit of bottleneck. There's also a noticeable laminate archtop-style response to the quick attack and rounded, strong high-end - it's a very nice jazz guitar. It records really well, too, and easily makes itself heard in an ensemble. On paper, this is a guitar you should probably avoid, but it has what so many low-end instruments lack: character. It really is perfect if you're into older acoustic styles and play with a pick or pick and fingers. It's a little cramped for complex fingerstyle, but it's far from impossible.